Hamar Experience 14 | Do you think a mango plantation on Stortorget is good for the environment? dreamhamar is focusing on green an environmental matters these days and that includes Hamar Experience 14. Don’t be surprised at the title, it is one of the many possible and impossible ideas we get for the future Stortorget. What do you think? Are mangos good for the environment? Send us your ideas and questions to dreamhamar@gmail.com and Belinda will answer them on Hamar Experience 14. 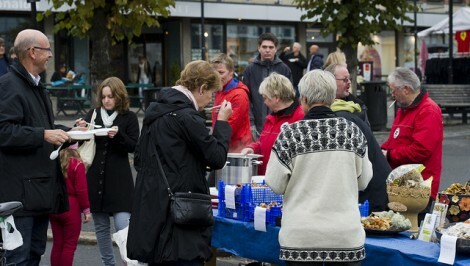 Belinda Tato will talk about Saturday 22nd event, greenhamar – see the people having fun on the picture? 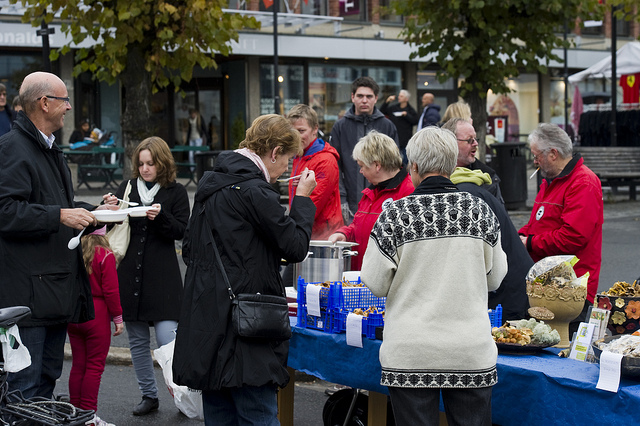 Naturvernforbundet, Natur og Ungdom, and Hexeringen mushroom gathering group offered free homemade local mushroom hot soup and smoothies at a new looking Stortorget square, courtesy of VEA School (Statens fagskole for gartnere og blomsterdekoratører). The weather forecast was 10ºC and a bit cloudy but there is not such thing as bad weather, only bad clothes, said once a Hamar neighbour. Have fun today at 18:00h with Hamar Experience 14 on your computer. Then, get active and green on Tuesday, Wednesday, and Thursday at 18:00 with Romy Ortiz and Jenny Pfau at the Bazaar building.